On Monday July 14th, the Lab announced the opening of their new Experience Keys activity – The Cornfield. I didn’t have much of a chance to look at things myself at the time, but simply had a quick nose around. This being the case, I hopped back when time allowed and took a closer look. First, the new Portal Park. Whereas the Linden Realms Portal Parks were fairly minimalist, being intended purely as waypoints to get to that game – which, I understand, the Lab has plans to update at some point in order to take advantage of Experience Keys – the new Portal Park design is far more of a hub, and so has a richer design. A central landing point offers a paved area with seats, flowerbeds and access to eight areas reached by short paths. These are: The Cornfield, Linden Realms, the Premium-only Magellan Hunt, the Wilderness Experience (which I missed noting during my brief visit on July 14th), what appears to be an as yet unnamed entrance to a sci-fi / post apocalyptic experience (not currently open), a social area, a Gnome Village and a Tea Party glade (where the LDPW and members of Linden Lab were enjoying themselves following the opening of the Park on July 14th). Whether these latter two are intended to become the entrance-point for future experiences or simply places for users to meet and chat, I’ve no idea. Each of the active games has a dedicated teleport portal, and the area in which the portal stands is themed on the game itself; so The Cornfield has an old barn containing its portal, for example, and the Linden Realms portal sits in a little meshy / cartoony space. Only The Cornfield is currently Experience Keys enabled – Linden Realms, the Magellan Hunt and the Wilderness Experience are all pretty much as they always have been since each opened in SL. 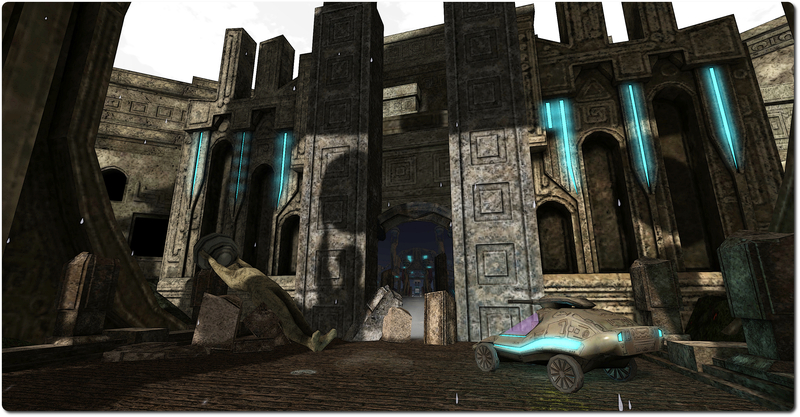 The sci-fi area of the Portal Park – the location for accessing a future Experience? An interesting point of note with Experience Keys is that until such time as the viewer-side updates have filtered through to all viewers, you don’t actually need to run the Project viewer in order to participate in an experience; any viewer is capable of receiving an initial invitation to join and Experience, and will allow you to do so. However, as the Experience Keys project viewer provides a lot more information about any given Experience and allows you to see what is happening with your avatar, it is perhaps preferable to use it until the viewer-side code is more widely integrated into viewers. 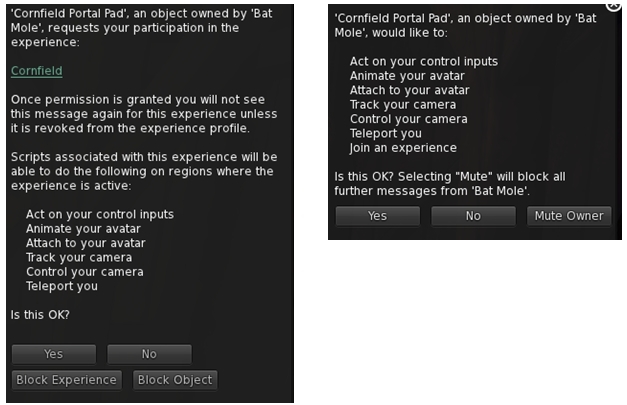 As you approach the teleport portal for The Cornfield, a dialogue box is displayed, asking if you wish to participate. The information displayed by this dialogue box will vary, depending upon whether you are using the Experience Keys project viewer or not. If you’re running the Experience Keys project viewer, clicking on the name of the Experience in the dialogue box opens the Experience Profile, allowing you to find out more about it. Allowing the Experience via the dialogue box will permit you to pass through the portal and be delivered to the start of the game area, inside another barn. Here you’ll find yourself equipped with a large basket, some basic armour, a large plank of wood, and a HUD. Clicking the “?” on the HUD will deliver the game instructions to you. The Cornfield is, at its most basic, very similar to Linden Realms – you spend your time running around, avoiding monsters (mutated “griefers” in this case), collecting corn cobs, jars of moonshine, and coins, rather than different coloured gems. However, there is also a lot more going on here. 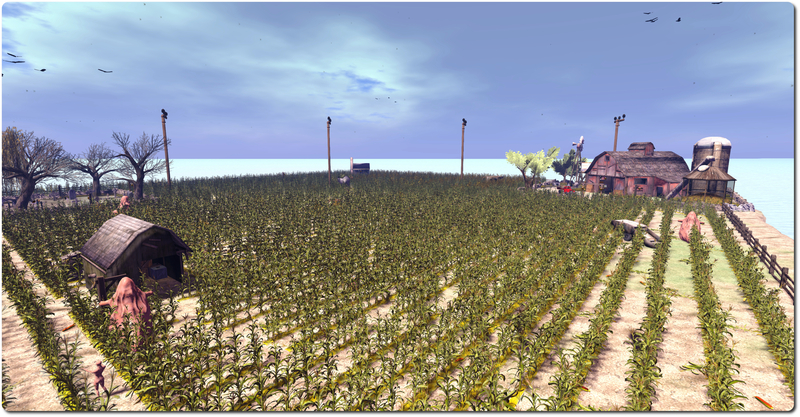 The Cornfield returns – as an Experience Keys demonstration! On Monday July 14th the Lab announced the opening of a new Experience Keys demonstration game, featuring a return to the The Cornfield. 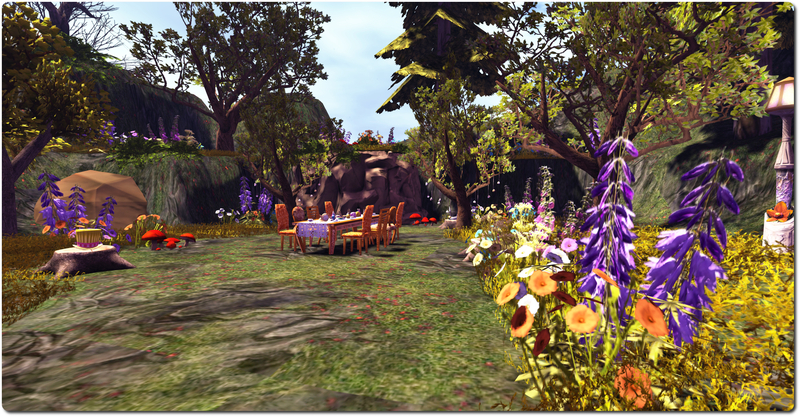 Experience Keys are a new tool in Second Life that make it so you can opt-in to an entire experience made up of numerous scripted objects, rather than having to grant avatar permissions to every individual element of that experience. In other words, they allow creators to make experiences that are more immersive, because they’re not interrupted by permissions dialogues. Additionally, with Experience Keys, each of the scripts in the experience has access to a common private database that stores information across user sessions and simulator restarts; a powerful new capability for scripters. Experience Keys are part of the Advanced Creation Tools the Lab has been developing over the last few years, and a special beta programme was recently opened to allow content creators the opportunity of trying-out the capabilities in their own experiences. 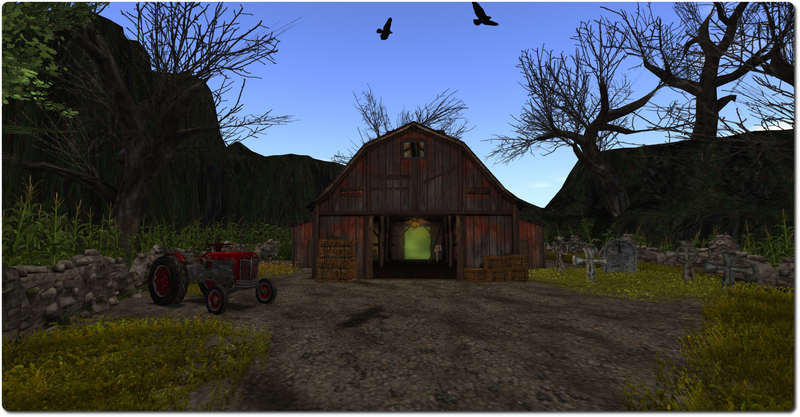 The Cornfield (reached via a Portal Park), created by the Linden Department of Public Works (aka the Moles), is based on a piece of Second Life history familiar to many long-term residents. The special trailer video below provides more information on the game. To try-out The Cornfield, you’ll need to download and install the Experience Keys project viewer. – and I’ll have a more detailed looks at this viewer available soon. 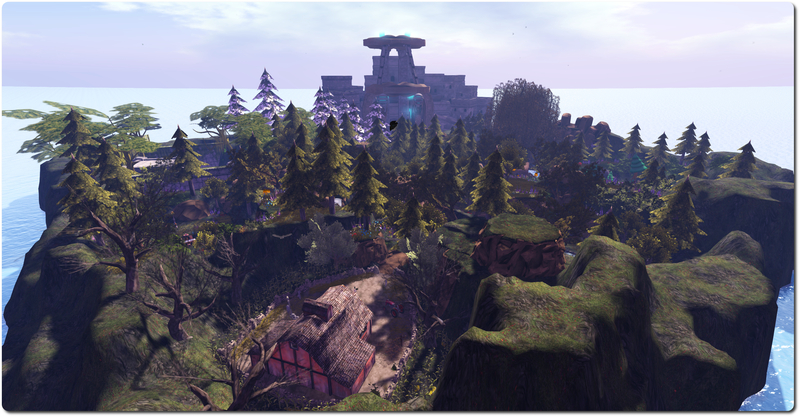 Like Linden Realms, the SLurl initially delivers you to a Portal Park, which has been updated from the originals, and offers a number of places to explore, as well as the portals to both The Cornfield and to Linden Realms or the Premium-only Magellan Grid Hunt (neither of the latter appear to have yet been updated to use Experience Keys). As the trailer suggests, The Cornfield is something of a shoot-’em-up, but with elements which will be familiar to anyone who has played Linden Realms – and there are wider game choices players can available themselves of as well. So if you’re in need of letting off some steam, grab the project viewer, install it, and head over to the The Cornfield and give Experience Keys a go!